NACE International Foundation’s 24th annual NACE Race 5K run/walk took place yesterday, Sunday, March 24th at Nashville’s Shelby Park. 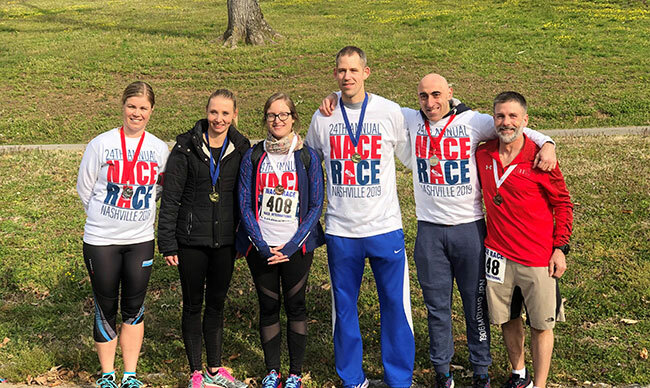 Each year, the NACE Race raises funds to support NACE Foundation’s efforts to inspire the future workforce in science, technology, engineering, and math (STEM) disciplines. This year’s event, which took place in the urban park along the Cumberland River, kicked off at 8:00 a.m. What a sunny way to spring into the week! Sponsors included Allied Corrosion Industries Inc., Anotec Silicon Iron Anodes, Sandvik, Advantage Resources Consulting, Arcelor Mittal Industeel, Chattanooga Boiler & Tank Co., Corrosion Testing Laboratories, Inc.,International Molybdenum Association, Nickel Institute, Nobel Clad, PM International Suppliers, Stainless Structurals, and Ta Chen International, Inc.
Congratulations to all of this year’s NACE Race winners and to everyone who participated in the event. We look forward to another great race next year in Houston! CORROSION 2019 will host an “open house” session hosted by editors and managers from NACE International’s Publications Division that details how to become an author for NACE publications and NACE-published books and compilations.